Planets reflect light from their host star, making them visible in the blackness of space. A new study says that planets can be detected from their auroras even if a planet has no reflected starlight, does not have a gravitational influence on a star, and does not pass in front of a star from our point of view. Interstellar planets — those without stars to orbit — could serve as havens for life, according to a new study. Interstellar planets might either be rogue planets that were originally born around a star and were later cast out by gravitational tugs of war, or sub-brown dwarfs that formed alone in interstellar space. Scientists have suggested that interstellar planets could support life under or even on their surfaces. "It has been speculated that Earth-like rogue planets could have very thick atmosphere that keeps them relatively warm, or moons of giant rogue planets could experience tidal heating and have oceans beneath their icy surface," said planetary scientist Heikki Vanhamaki at the Finnish Meteorological Institute in Helsinki. 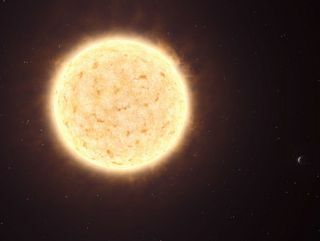 Planet hunters have used a variety of methods to detect the indirect effects extrasolar planets have on their host stars, because the planets themselves are too small and dim to be seen by our telescopes. For example, the slight gravitational wobble an orbiting planet induces in its parent star -- called the radial velocity method -- is one way to detect a far-off world. Another way to find a planet is when it passes directly in front of its star from our point of view, causing a momentary dimming of starlight. Scientists recently suggested that alien worlds around distant stars also could be detected by looking for radio waves given off by their auroras. Now Vanhamaki calculates the same technique might work for interstellar planets. The Hubble Space Telescope's close-up view of an electric-blue aurora on the giant planet Jupiter, eerily glowing one half billion miles away. Auroras occur when charged particles interact with magnetic fields. There are two ways that detectable auroral radiation might emerge from interstellar planets — either from the worlds passing through interstellar plasma, or from moons of interstellar planets as they zip through fields of plasma trapped in that planet's magnetic field, as is the case with Jupiter and its moon Io, Vanhamaki said. Vanhamaki found that auroral emissions linked with moons were roughly 100 times stronger than that from interstellar planets colliding with interstellar plasma. Detecting an interstellar planet the size of Jupiter using radio telescopes that either exist now or in the near future "may be theoretically possible, but extremely unlikely — perhaps practically impossible — in the foreseeable future," Vanhamaki told Astrobiology Magazine. Still, in very favorable conditions, he noted that an interstellar planet more strongly magnetized than Jupiter — for instance, far more massive and faster spinning — with a large nearby moon could be detected up to 185 light-years away with the Square Kilometer Array radio telescope planned for either Australia or South Africa. Voyager 1 took photos of Jupiter and two of its satellites (Io, left, and Europa). The new study says that moons orbiting a gas giant planet greater than 8 Jupiter masses could help astronomers detect a rogue planet. There may be about 2,800 interstellar planets within that distance, he added. "My results show that there is a real, although small, chance of detecting moon-induced emissions from giant rogue planets that weigh more than eight Jupiter masses," Vanhamaki said. Vanhamaki detailed his findings online April 17 in the journal Planetary and Space Science. This story was provided to SPACE.com by Astrobiology Magazine. Follow SPACE.com for the latest in space science and exploration news on Twitter @Spacedotcom and on Facebook.